together, with mutual support, and to live lightly and sustainably on the Earth right to the end of their days. Cohousing is the deliberate, intentional way of creating a physical community composed of private dwellings, communal space and shared resources. It is the ideal pattern for sustainable living. It is something that is created from the bottom up rather than from the top down. Rather than a developer building a complex of dwellings and looking for buyers, a cohousing project is created by a group of people with similar values and lifestyles working together to design exactly where and how they want to live. There are quite a few established cohousing communities in the UK. But almost all of them consist of families and people of mixed ages. Cohousing that is designed specifically for the over-fifty age group is already well-established and thriving in Denmark and there is now a huge interest in it in the USA but in England this idea is only just coming over the horizon. The benefits of cohousing for elders are enormous, since a group of compatible elders designing a cohousing project can tailor it to suit their particular needs. Here is an article that explains this in much greater detail, along with a list of useful references. The definitive book on the subject is The Senior Cohousing Handbook: A Community Approach to Independent Living, by Charles Durrett. This includes a well-thought-out—and well-tested— procedure that can be followed by any group wanting to start a senior cohousing project. The book is aimed at American readers but based mainly on research from Denmark and includes some great case studies. Old people are not very highly valued in our modern Western culture but this will gradually change as the population ages and an important part of that change is for mature people to re-imagine their role as wise elders and to support each other in manifesting that wisdom in the world. A cohousing community of like-minded elders can be a powerhouse of mutual support as well as providing outreach services to the wider community. 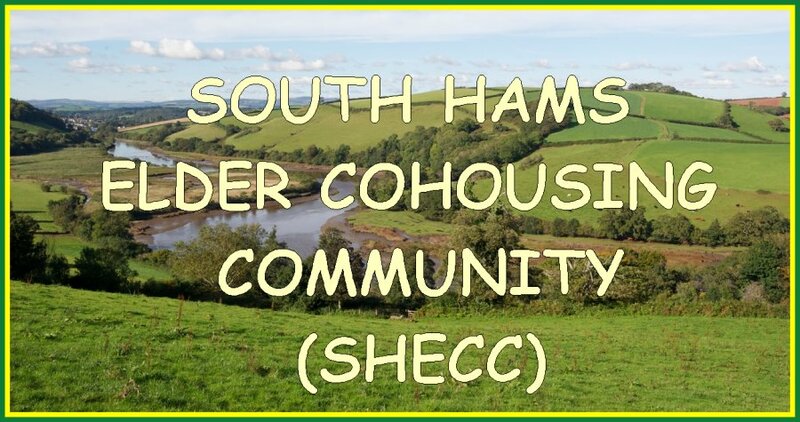 We are a group of like-minded elders who have come together with the aim of forming a cohousing community in the county in which we already reside (Devon). Our reasons for doing this are twofold: firstly, we see cohousing communities as a particularly good response to the current need for people to live more lightly and sustainably and to conserve resources. They also fit well into our Government's plans for local Councils to release both brownfield and greenfield sites for affordable housing and since people often sell up their homes to move into them this frees up housing stock. Secondly, most elderly people who do not intend to live with one of their children, do not want to leave their homes but find themselves facing limits in their ability to care for the place where they live. They can often be lonely. They do not want to end up in care homes and nursing homes. They want to live as independently as possible but in a mutually supportive community with like-minded people. A third advantage is that when cohousing communities provide their own elder care in-house, there is less of a burden on local service providers, the NHS etc. - to enable a group of older people, who might otherwise end up in care homes, nursing homes or living alone and needing daily care from Social Services, to 'age in place' together to the end of their days, with companionship and mutual support, and with all necessary services such as maintenance, gardening, cleaning and elder care paid for by the group themselves and provided on-site as and when needed. - to create a sustainable, self-reliant community that lives lightly on the land, has a lower-than-average ecological footprint, shares resources and gives back to the local economy more than it takes out. The project will ideally involve twelve to fifteen households. It will follow the standard pattern of senior cohousing communities (as pioneered in Denmark), i.e. with a community house for everyone's use plus small, independent living units for individuals/couples. These will most likely be low-cost, often self-build eco homes, making as much use as possible of renewable resources (e.g. solar panels on all roofs). They will mostly be one-storey, accessible and with ADLs such as ramps and rails already built in. There will be just two or three shared vehicles for the whole group instead of one or more per household and other resources such as laundry facilities, workshop, community vegetable growing areas, storage etc will be shared. The community house will include guest accommodation, lounge, kitchen and dining areas, art studio, therapy room etc. and be a versatile space for a host of activities, including the holding of classes, groups, workshops, etc for the wider community. The site will be landscaped to include fruit and vegetable growing areas as well as outdoor leisure space and be a haven for wildlife (which may mean having fairly strict policies regarding companion animals). The project will give back to the wider community in many ways. The optimum group will be composed of folks who will contribute a variety of practical skills and professional services and will include teachers, therapists, health practitioners and artists, etc. The essential binding quality is our mutual love and respect for Earth. After all, we are all Earthlings and share the bounty of Nature. We plan to offer groups, classes, workshops, therapy sessions, and other services to the local community, both on and off-site. Are you a green-minded elder interested in being part of this eco-friendly elder cohousing project? If so, please contact Marian McCain by email at marian(at)elderwoman.org (replace 'at' with the @ sign)and be sure to put 'cohousing' in the subject line so that your message doesn't get caught in a spamtrap.